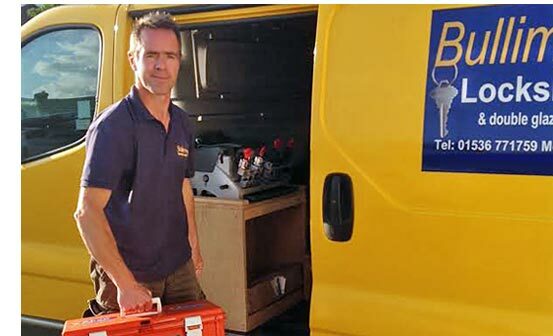 Corby Locksmith, 24-hour emergency and general locksmith services in Corby, Kettering, Uppingham, Oakham, Market Harborough, Oundle, and the surrounding areas. Locked out of your home and need us in a hurry or simply want to get your locks changed, we are able to help. Bullimore’s Corby Locksmith’s local reputation means that you can rely on us to provide an efficient locksmith service with a fast turnaround time, no matter what your needs. Because we won’t let you down! Our locksmith services are very competitive and we never charge call-out fees, therefore saving you, the customer money! So if you are in need of a locksmith in Corby, Oakham and Rutland, Market Harborough, Oundle, Stamford, or the surrounding areas, get in touch today. Bullimore’s locksmith services can cut keys at your home or business address, therefore you can be sure that they work perfectly! We provide a 24-hour, emergency locksmith service, so should you be either locked out of your home or if your property has been broken into, we can effectively have you back in the comfort of your own home in next to no time! Because we care about your security! We can also supply high security locks with anti-snap, anti-pick and anti-bump features, therefore making your property far more secure! Furthermore these type of locks are not as expensive as you might think and most of all give you peace of mind that you have the best security for your family home or workplace! One Key for the whole house? Why not… It’s convenient and there are less keys to lose! We can make you a system to suit your needs and even add padlocks onto the system for extra convenience! Or if you are a landlord and need a master key system tailor made to your specific requirements, we provide proven high quality systems at great prices!